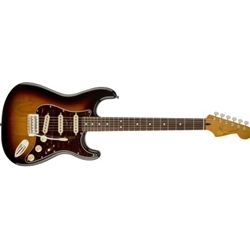 The Squier Classic Vibe Stratocaster '60s is a rough-and-tumble electric guitar ready for almost any musical situation. With an alder body; rosewood fingerboard; 21-fret, vintage-tint gloss maple neck, this Strat definitely has that '60s vibe but with the modern playability of a 9-1/2" neck radius and medium-jumbo frets. This Squier Strat's tone is thick with a custom set of Alnico V single-coil pickups-a quick attack with a bit more midrange oomph and a bridge pickup that packs a knockout punch! Custom stagger pole pieces provide improved string-to-string balance. Back in 1982, the very first Squier by Fender guitars and basses came ringing out of Asia. Known for their excellent vintage-quality look, feel, sound, and construction, those early Squier instruments and their Fender-branded counterparts are now highly sought-after collector's items revered by guitar enthusiasts as models of "getting it right" while aiming at value-conscious players. The Squier Classic Vibe Series reflects that simultaneous commitment to excellence, value and vibe. Mirroring classic Fender designs, the Classic Vibe offering is not intended to be era or vintage correct-but rather imparting the vibe of a classic Fender design. Each with distinctive feature set combinations-all adding up to one classic looking instrument. Great sound, vintage looks, unbeatable value-Classic Vibe!